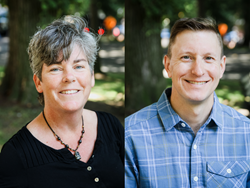 Long-standing mission-driven nonprofit, The Climate Trust, announces new co-leadership structure in wake of executive departure. We will continue to aspire to the same high level of service and commitment to our partners as we move forward with deployment of our Fund. In a joint statement, The Climate Trust leadership team and the Board of Directors today announced that Sean Penrith would soon be departing from his role as Executive Director for The Climate Trust (The Trust) in order to pursue new career challenges. Sean’s last day with the organization will be Thursday, March 15, 2018. The board has elected to elevate two dedicated senior staff members to executive co-leadership roles. Director of Asset Management, Sheldon Zakreski, has served in a leadership role at The Climate Trust for a decade and has been named Chief Operating Officer. Director of Investments, Kristen Kleiman, will now lead the investment branch of Climate Trust Capital’s work as Chief Investment Officer. U.S.-based private investment fund, Climate Trust Capital, is an independent entity of the long-standing mission-driven nonprofit The Climate Trust, with a focus on mobilizing conservation finance for environmental benefit and returns. Climate Trust Capital’s Fund I was Iaunched in October 2016, seeded by a $5.5 million Program-Related Investment from the David and Lucile Packard Foundation, and supported by a Conservation Innovation Grant from the USDA’s Natural Resources Conservation Service.